With Project Fruit I built around the Lemon Land mod and added a whole new dimension that's made of fruit. When you enter the fruit dimension you'll see four different biomes. The lemon biome, the lime biome, orange biome and the blueberry biome. Be sure to follow me on twitter to see the latest news and pics. All of the info can be found on my website! We are not looking for anyone to help texture or code. We are looking for people to report bugs and give us ideas! So if you find a bug, please report it here. If you have an idea, please submit it here and mark it as a enhancement. Thank you! 1: Download and install Forge. 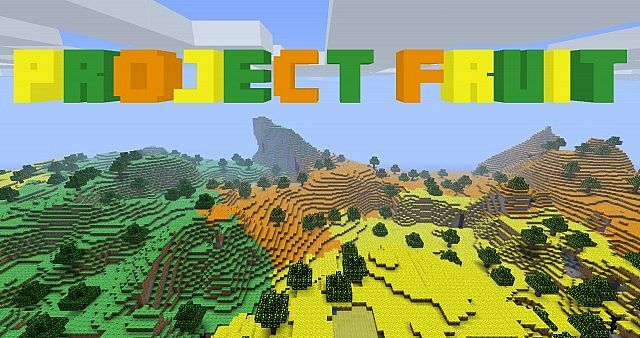 3: Move “Project Fruit x.x.x.jar/.zip” to your mods folder inside your .minecraft folder. i think this should be 1.12.2 as well, can you update?